This is my second post about the incredible 2014 SCBWI FL Regional Conference in Miami. There’s so much info to share with all of you, I had to break it into three posts! This one covers almost all of the general session, including an amazing agent panel. I’ll post again on Monday, February 24th with the editor panel plus workshops led by editors Laura Whitaker and Aubrey Poole. Click here to check out my last post about the Novel Intensive led by agent Jen Rofé, editor Stacy Abrams, and author Chris Crutcher. 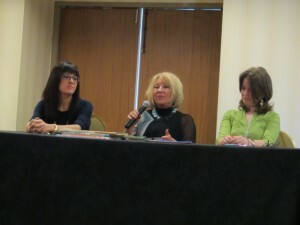 Lot of success with author/illustrators, multicultural and historical (especially MG), and contemporary YA. When asked how many editors she sends a manuscript to at a time and when she considers giving up she said she won't stop until she's exhausted every opportunity. The fastest she sold a manuscript—3 hours! The longest it took was four years. Often times, queries go to the bottom of the list because agents are busy with clients. Wish list: commercial character based picture books. A country song book for YA. Books based on childhood, like a girl who is getting into stuff she isn't supposed to do, but nobody would expect that. Don't send one query to tons of agents at once, and don't send over holidays. Loves when it's obvious that you've done your homework. She also loves getting referrals from existing clients. She loves to see good social networking in a client. Picture books have been huge this past year—they just exploded. The last couple of years, it's been skyrocketing. Science fiction is slower. Wish list: books that do something really different, a different narrative structure, different POV. Sometimes, if it's challenging to find the right home for it, it's even more rewarding in the end. She loves unusual projects, books based on childhood—travel, unusual vacations, anything to do with food or baking or French food. She loves caves. Get out there and tell the best story you can tell (worry about audience/marketing later). Looks for the juxtaposition of comedy and tragedy. Crystal Kite award winner Augusta Scattergood and her editor, Andrea Pinkney, for Glory Be. She shared the quote: It's never too late to be what you might have been. What she first sent Andrea is considered the 'pre first draft'—they worked very hard together on it. In fact, when a kid asked Augusta how she learned how to write, she said her editor taught her. All authors have something at our core that we're trying to correct by what we're doing—something we're trying to make better. And connection is one of the most important things about books. Write from the point of view of a character who feels deeply about things. She loves Clementine—she'd just sit in a dark closet all day and listen to her. Loves when the first line of a book poses a question that the rest of the book will answer. Try to keep character description off the first page unless shown vs told. If you tell on the first page, it gives the impression that there’s more telling throughout the manuscript. Start in scene more than action. Less description sometimes helps readers imagine how characters look. Don’t start with an introduction (it isn’t interesting). He found the quote: "Good artists borrow, great artists steal." He thought—pursue things that really inspire you and make it your own. He started thinking about why he loved paintings and saw patterns in the things he loved. Never give up. Learn from your mistakes and keep going! If you can't sell something, put it in a drawer for a year or two and get it back in the market. If you really think it's a good book—keep it! She wrote Hotel for Dogs and it didn't do that great...then she sold the movie rights about 35 years later. It went into successful movie, so Scholastic republished it. The stories are really important. So go forth and write those stories! Thanks so much for sharing your notes! Florida does such great SCBWI events. You're welcome. :) I feel lucky to live in such an active region! Our RAs actively look for great speakers at the national conferences. I think the FL sunshine in January and the fun atmosphere of a workshop on Disney property over the summer help convince speakers to join us. So true about the draw to FL in Jan! Mindy, Thanks so much for sharing your notes! It's a nice peek into what's happening at conferences when you can't attend. So much information, I'll have to come back and reread from time to time. Hm. Or, hehe, copy . . . Thanks for sharing your notes, Mindy. I appreciate it!